First Floor 1557 sq. ft. 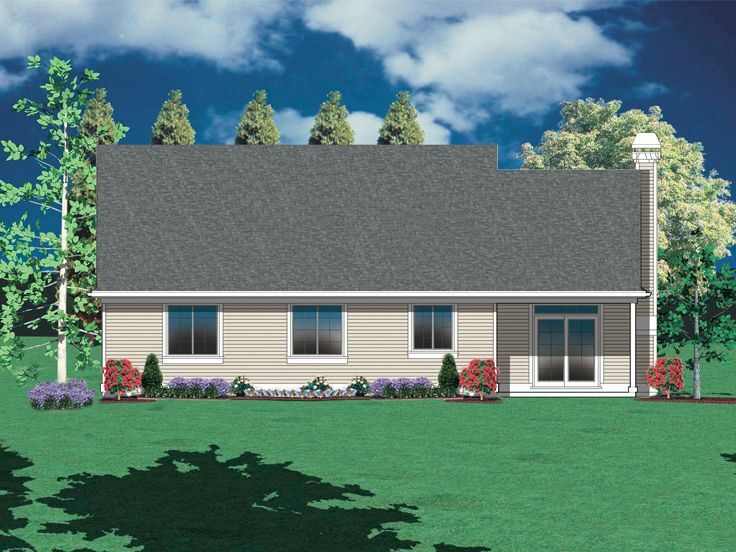 Tall windows, a columned and covered entry, and a delightful front porch infuse this ranch home plan with a friendly feeling. 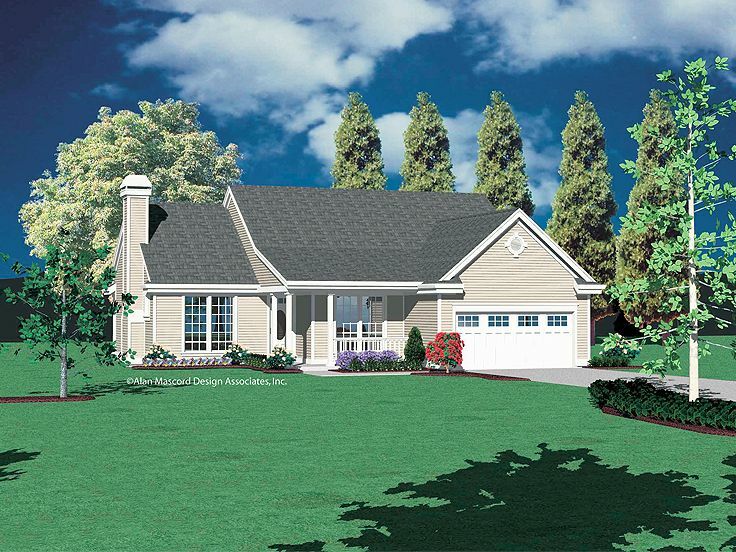 It's a home that says "welcome" to both family and guests with its blended country and traditional styling. 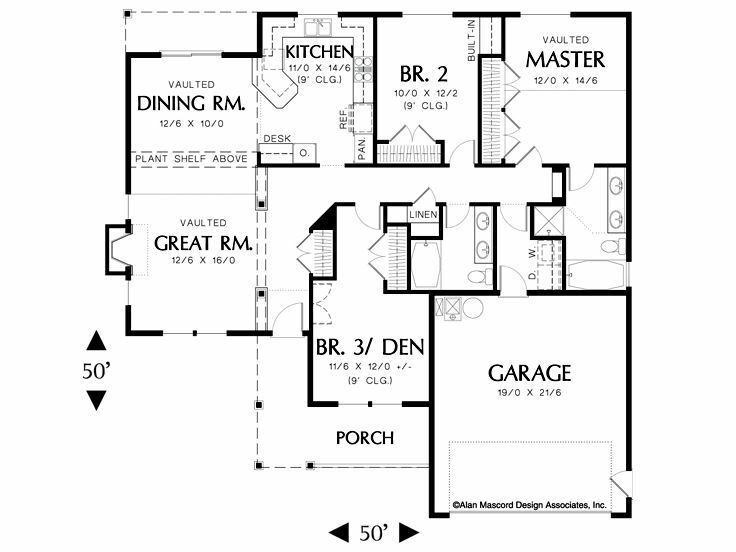 The very practical floor plan is traditionally laid out along a central hall. Common gathering areas are situated to the left of the foyer, enhanced by decorative columns, vaulted ceilings and a fireplace flanked by windows. To take full advantage of light and the views, windows in the great room are aligned with sliding patio doors in the dining room. Fashioned with a step-saver design, the kitchen enjoys a pantry, sit-down snack bar and planning desk. You choose the role of the adaptable room to the right of the foyer, ideal for a bedroom or a den. 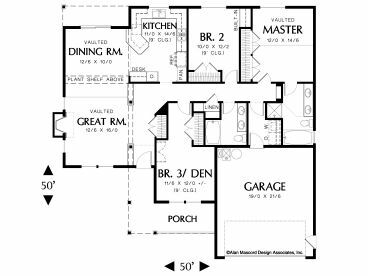 With the den option, consider the double door entry off the foyer otherwise, note the hall bath equipped with a double bowl vanity offering efficiency as it serves both secondary bedrooms. The spacious master suite includes double closets, a vaulted ceiling and a bath with a double vanity, a tub, and a walk-in shower. Small and affordable, this country traditional home plan delivers comfort and function for those with a modest budget.